View of the Koen from the 1960s. Photo by R.W. Neelands. Established in 1951 in northern Arkansas, the Henry R. Koen Experimental Forest (Koen) is covered mostly in oak-hickory upland hardwood forest and oak-pine stands. 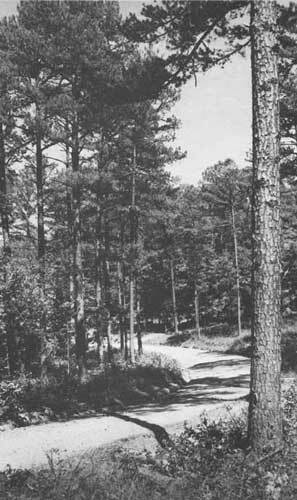 Named for Henry R. Koen, forest supervisor of the Ozark National Forest during the first half of the 20th century, the experimental forest was set aside to develop scientific principles for forest management. At 720 acres, the Koen is the smallest of the 19 experimental forests managed by Southern Research Station (SRS). Forest Service facilities include an office, garage, and workshop. The Koen also features a handicapped accessible nature trail established in collaboration with several local civic organizations. Visitors from across the United States and around the world use the trail and picnic area. Through 1979, research at the Koen focused on upland hardwood forests. Researchers conducted numerous studies from the early 1940s to the late 1970s on the effect of stand structure on white oak stands, forest inventory sampling design, improvement harvesting, and small woodland management. Two long-term datasets resulted from research at the Koen: a study of red cedar that began in the 1940s and ran through the early 1960s, and a watershed study that ended in the late 1970s. Today, the Koen serves as the fieldwork base for SRS upland hardwood research across Arkansas. SRS research forest ecologist Marty Spetich manages the Koen, where he leads an integrated research program of 17 studies on upland hardwood forest dynamics and both short- and long-term studies at three scales: individual tree, stand, and region. These studies encompass forest species restoration, quantitative silviculture, development of forest management methods, forest ecology, disturbance ecology, landscape ecology, climate change, forest biomass, and diversity of Arkansas upland hardwood forests. For more information, email Marty Spetich at mspetich@fs.fed.us.